As a paramedic who dives, I've heard that it's important not to administer Entonox to a diver who might have DCS. Please could you clarify the medical/technical reasons for this? 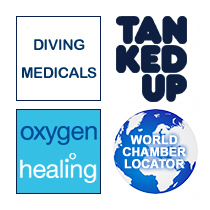 What about if the diver is not showing any signs of DCS, but just needs pain relief? Entonox, which goes by the more colloquial names of “laughing gas”, “gas and air” and “phlogisticated nitrous air” (thank its discoverer Joseph Priestley for that last one), is a 50:50 mix of nitrous oxide and oxygen. Priestley, an English chemist, first synthesised it in 1775 and was so impressed with himself he wrote: "I have now discovered an air five or six times as good as common air... nothing I ever did has surprised me more, or is more satisfactory." This was probably due to the fact that it smells and tastes sweet, and induces a pleasing euphoria together with “slight hallucinations”. It soon became the anaesthetic of choice for dentists, but nowadays its main proponents are (para)medics who use it for emergency on-site pain relief, madwives who administer it to women in labour to stop them screaming, and Mr. T who occasionally injects it into his engine to escape the clutches of Colonel Decker in The A Team. And the odd blissed-out hippy at a psychedelic music festival.